NEW ORLEANS – There was big movement once again in the latest edition of the NCAA Division II Men’s Cross Country National Coaches’ Poll released by the U.S. Track & Field and Cross Country Coaches Association (USTFCCCA) on Wednesday. Twelve of the top-17 teams saw change which included six of the top-10 programs. Adams State was selected as the No. 1 team in the nation for the fifth consecutive week to open the 2018 season, once again collecting all eight first-place votes. The Grizzlies were off from competition but will return to the course this weekend with the running of the Fort Hays State Tiger Open on Saturday. Adams State is trying to match last year’s run of six-straight weeks to open a season atop the poll. Grand Valley State held in the No. 2 spot after also not racing this past weekend. The Lakers will return to the course at the Jayhawk Invitational this Friday. Falling to the No. 3 spot was Colorado Mines although it wasn’t much of a decline as they were just tied for second with Grand Valley State last week. The Orediggers will meet up with South Central Region rival Adams State at the Fort Hays State Tiger Open this weekend. Chico State remained at No. 4 after also being idle. The program will be back with the Bronco Invitational on Saturday. Improving one into a tie for No. 4 was Western State after an impressive showing at the Lewis Conference Crossover Invitational this past weekend. The Mountaineers scored 84 points and were led by Taylor Stack in fifth-place. No. 6 Augustana (S.D.) remained in its previous rank after being off from competition. The Vikings head to the Wisconsin-LA Crosse Invitational this weekend. Shooting up four spots to No. 7 was Queens (N.C.) after a second-place finish at the Conference Crossover. The group scored 115 points and placed four runners in the top-26 of the meet. Daniel Wallis paced the group with a sixth-place performance. Coming in behind them in No. 8 was Simon Fraser after a five-spot improvement from the week before. The Clan placed third at the Conference Crossover with 127 points. The unit had three athletes finish in the top-20 and was led by Rowan Doherty in ninth overall. It is the new highest mark received by the program in school history. Moving up three into No. 9 was Saginaw Valley State who was off from competition this past weekend. It ties the second-best mark received in program history. The group will race again at the Jayhawk Invitational on Friday. Rounding out the top-10 was No. 10 CSU-Pueblo after a fifth-place showing at the Conference Crossover. The ThunderWolves will be off until the RMAC Championships in early November. Six of the next seven teams and eight squads overall from No. 11-21 saw movement with the biggest improvement in the poll belonging to No. 12 Cal Poly Pomona after shooting up eight spots. The Broncos took fifth at the Capital Cross Challenge this past weekend and knocked off 10 Division I teams at the meet in the process. No. 11 Dallas Baptist (up two spots), No. 12 Missouri Southern (up three spots), No. 15 Lee (Tenn./up two spots), No. 15 Sioux Falls (up one spot), No. 17 Walsh (up two spots), No. 20 Malone (up one spot) and No. 21 Stonehill (up three spots) also improved in that range of programs. In total 17 of the previous top-25 teams had movement. New to the poll this week was No. 14 UC-Colorado Springs, No. 18 UC San Diego and No. 19 Western Washington. Out of those teams only Western Washington received votes in the previous poll. Black Hills State, Southern Indiana, Edinboro and Augusta also received votes. 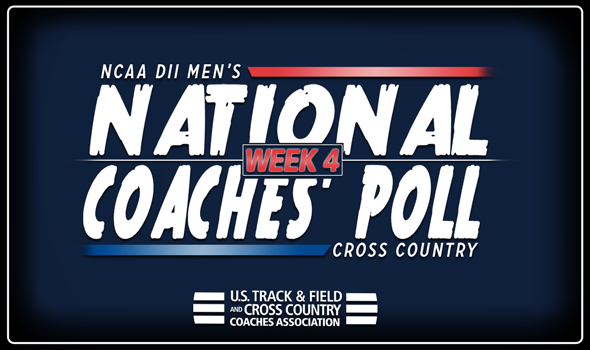 Be sure to keeping checking in with the poll as more change is expected with another big race weekend this week along with Pre-Nationals just around the corner on October 20 at Slippery Rock.